Happy Holidays from EMBARQ! Photo by Darren and Brad. For those of you out there who have yet to buy your family and friends holiday presents, consider checking off wish lists with transit-centric swag. DIY, transit provider sponsored and homespun tchotchkes and apparel exist in quantity. Consider this 3D t-shirt of Chicago’s L Train for your urbanite boyfriend? Perhaps this embroidered wall art of Le Metro for your Parisian grandmother? I would personally fancy this London tube map bow tie. Representing DC’s Metro in the abstract with fine art is also high on this blogger’s Christmas wish list…if not, this quilt will suffice. For the jewelry inclined, these DC and Paris Metro earrings are a great gift for showing transit love while in public. For those in your life more keen on mapping-out in private, this shower curtain will keep your bathroom dry while planning your next trip. While you’re at it, that same bathroom could be illuminated in style via Metro. 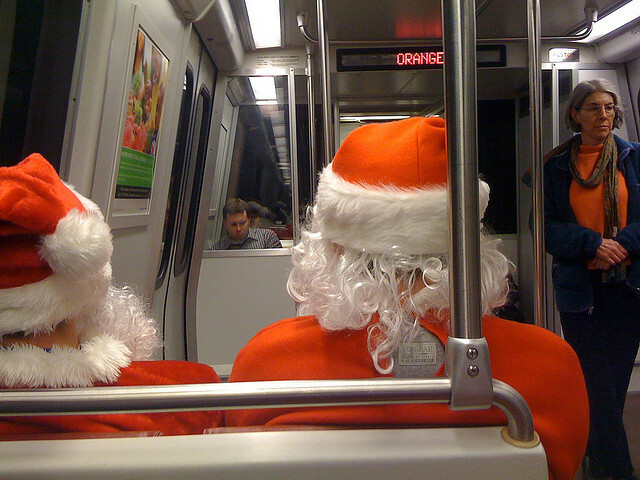 The transit gift giving possibilities are boundless, but may require transfers. Happy Holidays from Everyone at EMBARQ! Tags: Chicago, London, maps, mass transport, metro, metro maps, Paris, santa, The L, the Tube, Washington, D.C.